He made it from an old pipe organ! 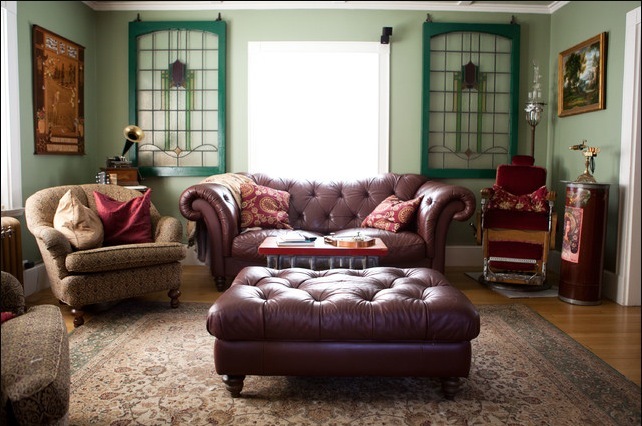 See lots more photos of the house here, and thanks to all of you who sent in the link! This is a real book. Yep, it's Star Wars, "reimagined in glorious iambic pentameter." Oh. My. Bard. It's not out 'til July, but you can pre-order the hardcover at that Amazon link up there for less than $12! Suh-WEET! I think I want it just for the cover art. Is that wrong? 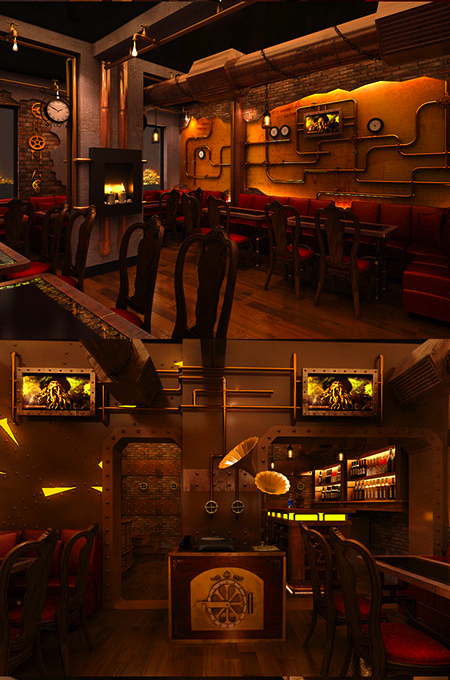 Next up, we're getting a double-dose of amazing steampunk decor today, because Sarah M. spotted a steampunk restaurant that's guaranteed to make you swoon. Me, I'm already on the floor. Look at that door! And the recessed lighting on those walls! With the pipes and the gauges and the dripping-pipe light fixtures! AAAIEEE! If I ever win the lottery, my entire house is going to look like this. (Well, except maybe my office. It's kinda hard to fit Ninja Turtle and Stay Puft art into this style. :D) Oh, and sadly this little slice of riveted heaven is all the way in India, so I guess I won't get to drool on it in person. Boo. Think it's too much to hope for a franchise? See more pics over on TecheBlog. So fun! And that's officially something I never thought I would say about disembodied tentacles, y'all. Hope you guys are having a great weekend! As always, please share your steamy creations/finds here in the comments or over on the Epbot Facebook page! Love!! I get to go to a steampunk event in-wait for it- A GHOST TOWN. And Steam Powered Giraffe is playing! Woot! It's this weekend in Calico Ghost town if anyone's in the SoCal area and wants to check it out! Oooh, my friend who works at an independent bookstore in town got an advanced reader of Shakespearean Star Wars, I read a bit of it, and it is sooo great! It's funny and clever! AND, there is artwork scattered throughout the inside as well; it's not just cover candy! I don't know I you watch Project Runway on Lifetime (guilty pleasure show... the clothes are so PRETTY! 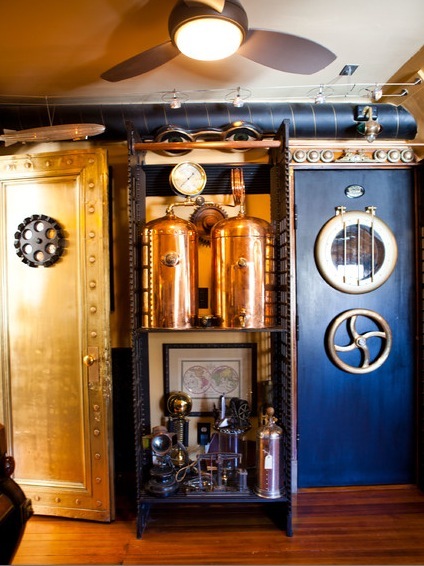 ), but this year's winner, Michelle Lesniak Franklin, did an awesome steampunk-y final collection. Now they never said the word steampunk but there was hardware, and hipbags and compasses, and all sorts of steampunk-y details that I just loved! Check it out! Just wondering if you happened to see the final show of this season's Project Runway? One of the designer's, Michelle, did a whole steam punk styled collection for her fashion show. It's a for certain must see if you missed it! I loved that video. That guitar was beathtaking! I would love to have one, even though I don't know how to play a guitar. I would just hang it up on the wall for a display. I loved every bit of this post. 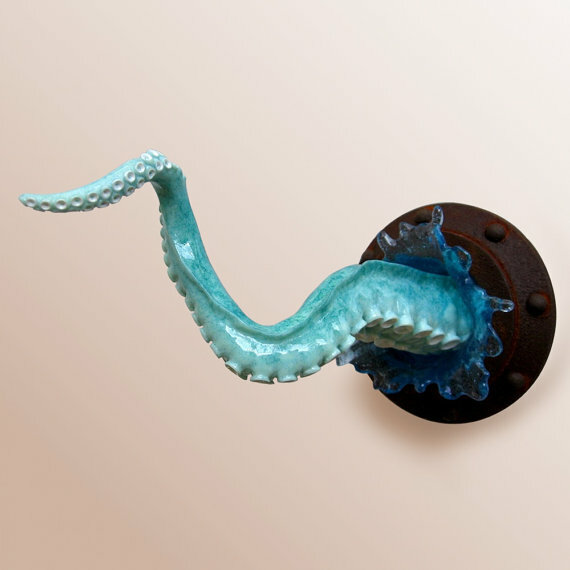 However, when your facebook link said 'tentacle wall art' I immediately imagined tentacles coming out of the walls holding sconces or fake torches and an octopus chandelier. Not sure why those popped to mind but now I am bereft. I'll be scouring the web for them now. I really don't think that restaurant is real...some of the angles and the lighting is wrong. It'd be hard to light an interior like that for a photo. Maybe it's a virtual model of a restaurant in the works? So fun! 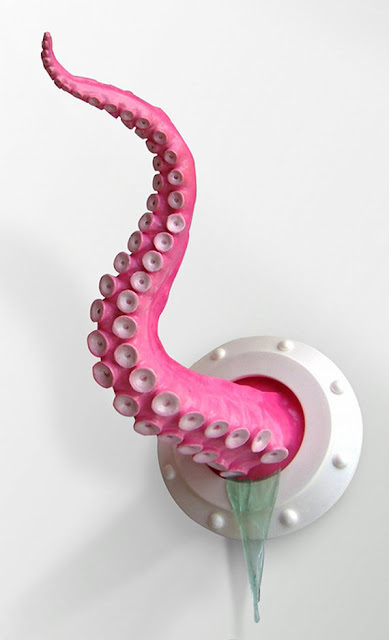 Pink tentacle for me, please! 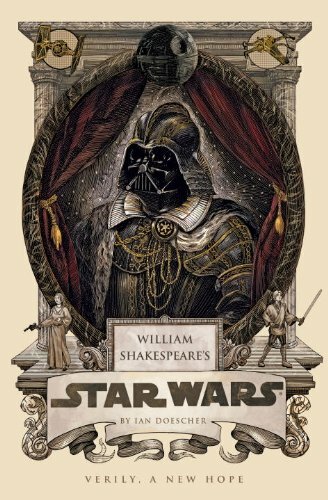 I just got an advance copy of the Star Wars Shakespeare book, and it's really fun. I am also happy to report there are illustrations inside as well! The girl minion and I had dinner there tonight. 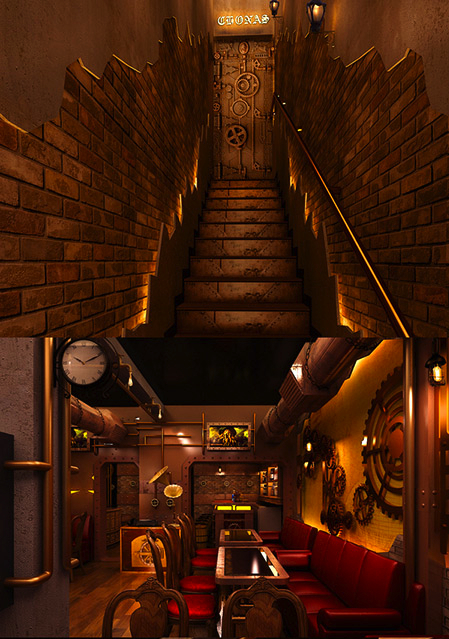 Fabulous menu, A-maz-ing desserts and cool steampunk decor. Extensive beer & wine selection if you are into that. 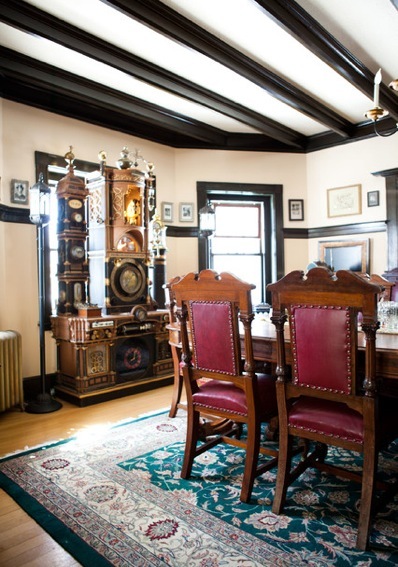 I am dying for a Steampunk home of my own! Hopefully it is in the future for me! 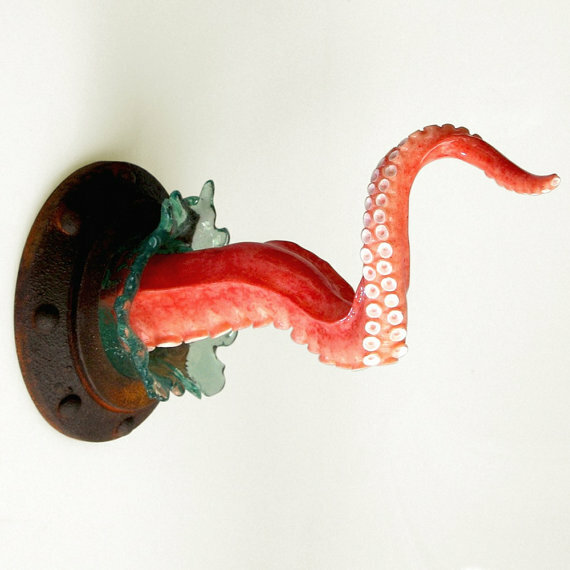 Oh, I'm so glad you featured the tentacle sculptures! I bought one (from Art Akimbo)several months ago and it's been stopping people in my doorway at work ever since. "Uh ... is that an octopus?" is the general stuttering comment. We are redoing a bathroom soon and I want to commission one high in the shower. I think guests would love it, once they get over the shock. The restraunt looks seriously CGI. I'm not sure if that's just crazy lighting or if it's not real... hope it's just crazy lighting, because I've LOVE for it to be real! I just pre-ordered that book, it looks amazing! Do We Need a New Word for "Geek"?